During This year's World Mobile Congress Nokia introduced several enhancements to its in-home Wi-Fi solution. This follows the acquisitions of Unium, a US-based software company that specializes in mission-critical and residential Wi-Fi applications. 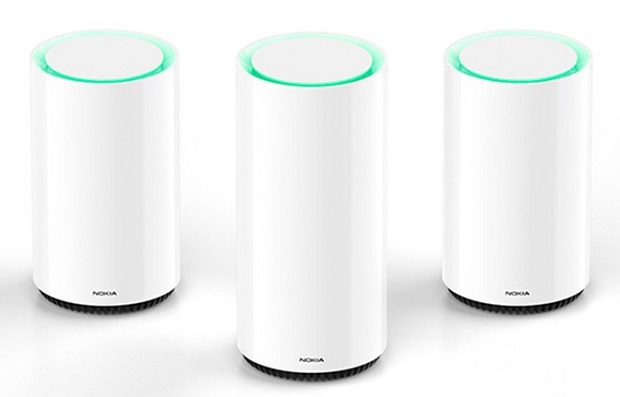 The new Wi-Fi solution expands Nokia's portfolio with meshed Wi-Fi gateways and beacons the offer intelligent Wi-Fi signal management that maintains signal strenght and bandwith. Being internet ready is a necessity if not a big selling point for hardware vendors. Many manufacturers haven’t got the resources to redevelop their devices that need internet connectivity. Therefore, they struggle to take advantage of the “Internet of Things” market. Electric Imp has come up with a solution with their Imp card; looks like an SD Card, but is much more powerful. Hybrid home networking will move from specification to reality with the introduction of a new nVoy certification and marketing program for HomePlug, MoCA, Wi-Fi and Ethernet products implementing the IEEE 1905.1 hybrid networking standard. By providing a common communication protocol, nVoy Certified products will enable consumers and service providers to leverage the strengths of the wired and wireless networking technologies prevalent in many homes today. Broadcom has launched a new line of HomePlug AV2 solutions that offer better speed than HomePlug AV. The new line of Adaptive Home Network solutions includes two new powerline communications systems-on-a-chip (SoCs) that integrate with Wi-Fi, set-top box, gateway and TV platforms for superior in-home Internet coverage and reliability. Honeywell has expanded their connected home portfolio with the introduction of two new security and home automation products: LYNX Touch 5100 and Tuxedo Touch Wi-Fi. Both products were develop for busy parents who cannot be in two places at the same time. With the new solution, parents can control home appliances from their Smartphone, Laptop, Tablet or other web-enabled devices.